EBEC is now carrying Dinadi products! Dinadi is a social business in Nepal that ethically hand crafts knitted and crocheted products while changing lives through dignified jobs. "Hi, my name is Bimala and since I was a child my passion has been to knit. During the earthquake of 2015 my home collapsed and I lost everything. We lived in a tent and didn’t have any food but last year a received an opportunity to knit for Dinadi. Now I don’t only get to save up money and pay pack loans, I also get to work with my passion and do so within a community where we cheer each other on and acknowledge that everyone is important. What I have learned and received here in my Dinadi family, I dream to pass on to my daughter." "Hi my name is Pramila and I joined Dinadi almost a year ago. Before Dinadi I felt hopeless. I felt like the only thing I was good for was taking care of children and doing the laundry. I now understand that’s not all I am and I’ve found a new joy and belief in myself. At Dinadi we talk a lot about excellence and I want to learn to do all things in life with excellence. I so appreciate the opportunity Dinadi has given me and my dream is to see Dinadi grow so more ladies like myself can experience love and respect and empowerment as I have experienced." "Maina is a hard worker who finds her drive in her family of three. She is recognized by her big smile and generous laugh and she is a lot of fun to be around. Her family used to be completely dependent on her husband’s income that would barely cover their needs but now her extra income is bringing change to their lives and is allowing Maina to dream and plan for her son’s education. " On one hand, we are so blessed with everything we need and more to live a comfortable life in a big, American city. And on the other hand, I am feeling the burden of taking care of our belongings. This summer, we organized, purged, packed, moved, unpacked, re-organized, and purged some more. And we cleaned the old rental house, and cleaned the new rental house. I'm not a hoarder, I'm a military spouse who knows how to let go of things and live with less, but we still have more than we need. Anyone else? So, I wanted to let y'all know, EBEC is still a one-woman operation and I'm a little behind on Fall 2016! I'm planning on vending at a couple of Fall and Christmas markets with what I have in stock, and I'll be preparing more for next year. There is a growing trend in today's marketplace--businesses that not only sell a product, but engineer their business model around supporting humanitarian causes or fair trade. Most of us have seen products like this or maybe have even bought a pair of shoes with the added satisfaction that a person in need would also benefit from your purchase. I'm hyped about this trend because it's truly beginning to change things around the world while expanding the role of business. Traditionally we've seen businesses with philanthropic interests donate money toward causes and rely on non-profits to figure out how to best use it. While I certainly don't think that's a bad thing, it does add a "middle man" to the process, and at times well intentioned non-profits end up spending as high as 30-40% of their donations on administrative costs and fund raising. Ever since the Revenue Act of 1954, the IRS has used the 501(c) designation for organizations like this. While it definitely helps non-profits lower their overhead by exempting them from taxes, it has also come to define our culture's perception of how to effect positive change in the world. After all, if you're a non-profit everyone knows that you are aiming to benefit others with your proceeds--and rightly so. The problem is when you are a for-profit business that seeks out the same type of social impact, often there is skepticism of the motives or sincerity of that business because of the fact that they keep some of the profit. However, before the 501(c) designation existed, an organization didn't have to choose between making money and making a positive impact on society. They were simply judged by how they conducted themselves in the marketplace. Why can't a business both make money and drive social change? What if the way a business made money was directly tied to the causes it supported? Is that even possible? That is why I'm stoked to see a new way of doing business emerging in America. We call it, "business with a purpose". There are many ways to accomplish it, but the way we do it is by using a manufacturer who supports fair trade by hiring those who have been exploited by forced labor and/or human trafficking. They train them to sew, pay them a fair wage, and teach them life skills to help them become a contributor to their community. The result is the more clothing we sell, the more money goes to that cause because they actually produce the product. benefits, and social change is pushed forward simultaneously. The way we all do business really can drive social change, but it requires intentionality from us as consumers to choose companies that care just as much about the impact they make as they do the profits they take. I recently got to meet a real, live Texas Organic Cotton Farmer! Evan Brooke: So who are you? What do you do? And what’s the Co-Op? Kelly Pepper: Well, I’m Kelly Pepper and I’m the staff manager of the Co-Op. I’m one of two employees of the Co-Op that handle the marketing of the organic cotton grown by our members and then the administrative duties of the Co-Op. I was a conventional farmer originally and then an organic farmer. And I have an accounting education and small business experience. So, I combine all that in managing the Co-Op and it’s been a very pleasant experience. Our Co-Op has about 35 members that produce most of the (organic) cotton grown in the United States. So, the Co-Op was formed in 1993 and many of the founding members are still actively involved on the board of directors. The members were some of the kind of pioneers in the organic cotton industry as it developed and evolved in the United States. Evan Brooke: What is Organic Cotton? Kelly Pepper: The standards prohibit the use of chemical pesticides, fertilizers, defoliants, as well as GMO seeds. The standards also require doing things to improve the health of the soil, like using crop rotations and cover crops. Evan Brooke: What about weeds? How do y’all control weeds? Kelly Pepper: Well weeds are the biggest issue that our farmers deal with from a production standpoint. It is absolutely essential that they control the weeds with mechanical tillage. Evan Brooke: How do you find people to help work the fields? Kelly Pepper: That can be a problem. Labor is key for our farmers. So, their attitude is to pay top wages, treat people right, and get the best employees that are out there. And take care of them and keep them for a long time. Because organic farming does require more labor than non-organic, it’s just a critical part of the operation. Evan Brooke: So, how much cotton is grown in Texas and how much of that is organic? Kelly Pepper: In recent years there’s been between five and six million acres of cotton grown in the state of Texas. Of that, less than half of one percent is organic. Some people laughingly like to say if you round the numbers it’s zero. Texas organic farmers have grown between 14 and 18 thousand acres of organic cotton in recent years. And those acres have produced between 6 and 14 thousand bales of organic cotton. The production varies greatly because of weather, especially rainfall. 70% or so of the acres are not irrigated and the production varies greatly depending on how much rain there is. That variability of quantity of supply creates marketing issues obviously. Evan Brooke: How much cotton gets lost due to not using pesticides? Kelly Pepper: Well, we are blessed in the high plains of Texas that insects are not a big problem. And so our farmers basically don’t worry about insects. And in most years, they may suffer a little bit of lost due to insects. But in general, if you leave it alone the beneficial insects will take care of the problems that come along and it’s not a major problem. Evan Brooke: What’s your passion for expanding organic cotton here in the U.S.? Kelly Pepper: I’m passionate about U.S. production not only at the farm level but on the manufacturing level, creating jobs here at home for the textile industry. And so, not just selfishly for the Co-Op and it’s farmers, but for the U.S. manufacturing. I would love to see it grow and procreating jobs for Americans. But the reality at this point in time is you can’t buy U.S. cotton, manufacture a product in the U.S., and be price competitive with something that’s being imported from India. Evan Brooke: What’s it going to take then? Kelly Pepper: Well, that’s a much bigger economic, global question than I have an answer for. I’m excited, Evan, about what you’re doing in trying to start up a program using our cotton and manufacturing it in the U.S.! We just really want to support what you’re doing and what others are doing similarly to build the textile industry back up in the U.S. and create jobs here at home for our people. Get your Texas Grown & Sewn Ringer Tee here! Boys & Girls, sizes 1-14. Refugees are those who have left their own country to escape war, persecution, or natural disaster. Did you know that in the last 5 years, Texas has brought in more refugees than ANY OTHER STATE? One reason for Texas embracing those fleeing their own countries is the state’s sheer size: It is the second-largest state by population and square mileage, and so has the capacity to accommodate more people. There are also a number of non-profits helping refugees in the resettlement process, which creates a large support system. Over the last few months, EBEC has formed partnerships with refugee groups in Austin and San Antonio. Evan, Emily, and Thang at Open Arms, reviewing the brand new Texas grown & sewn Tees! Open Arms is a non-profit social enterprise of the Multicultural Refugee Coalition in Austin. They offer living-wage employment to refugee women in Austin. EBEC's Texas Grown & Sewn Tshirts are produced here! Los chiquitos locos in their loco local Texas Grown & Sewn shirts. The goal for these shirts was to make sure EVERY PART of the supply chain upheld fair trade standards, so we used Texas organic cotton and produced them in Austin. I even visited with a Texas Organic Cotton farmer in Lubbock, TX. These organic cotton shirts respect the Texas plains by avoiding chemicals and support Texas jobs on the farm and in Austin! I have also started hanging out with the refugee ladies in San Antonio! I saw some of their beautiful work at a Christmas market last year and asked if they would like to make a few simple items for the King William Fiesta Parade in April. They said yes! So they made these adorable "Turban Twist" headbands and Fiesta skirts. Kimmie loves headbands and girly skirts. These will be available at the King William parade in San Antonio on April 23. Wouldn't it be great if most of our clothing was made locally, like how it has been throughout history before about 50 years ago? Many refugees come in "pre-screened, fully documented, and eager to work." This kind of employment is a blessing to so many refugees in Texas. And boy, do they have some stories to share!! Friday morning sewing class is a fun time to learn and practice sewing skills, and form friendships with women from ALL OVER THE WORLD! My church buys tshirts for the different ministries we have going on. I bet yours does too. Should a church spend extra on fair trade or ethically-sourced tshirts? Tshirts should be made of organic cotton or recycled materials, as well as ethically manufactured. Organic cotton is a must because it is too dangerous and risky to use all those toxic chemicals on a farm, and we should have some respect for our farmers and the "least of these" in the surrounding communities who drink the local water. My need for another Tshirt should not hurt someone else's health. Ever. "Ethically produced" means garment workers are paid a fair living wage, working in a safe environment, and treated with respect. The best way to tell a brand is ethically made is if they are BRAGGING about social & environmental responsibility. You should see pictures, videos, quotes, etc on the website to prove it. Patagonia does this well. They should also have some outside stamp of approval, like a Fair Trade certification or federation member, B Corporation, or GOTS certified. You can do a little googling on the country of origin to see what the situation is like over there. Haiti is rough. I'm not going to say "Bob Loblaw" is outright lying, but I want a little more information from the website. Those shirts are cheap, and they have no certifications. It LOOKS like they do, with their pretty graphics and wording, but it's not there. However, maybe they're a start-up like me and just haven't done all that yet. You can call and ask. I found one factory in my quick research here that is on the right track in Haiti, Industrial Revolution, but I'm still searching for how to buy their blank Tshirts. So instead of just criticizing and complaining, I have a solution! Texas grown & sewn shirts, with a fully exposed supply chain that includes Texas farmers and providing work for local Refugee women. I am planning to market the Tshirts to churches and non-profits, groups who are trusted to use funds to bless others and combat abuse locally and globally. Cheap clothing supports slave labor and human trafficking. It's time for the church to get involved! Did you know that there is slave labor in the supply chain of MANY items in your house and on your body? The problem is HUGE, but there are a few small changes you can make in your shopping habits that can make a big difference. Fight back. Promote freedom and human rights by switching a few of your brands. Check out this website to investigate apparel, electronics, and foods. "I want to have an ethical wardrobe, but I just don't know where to start!" 1. Decide on a capsule wardrobe, keep only what you need. 2. Buy only what you need from fair trade & ethical sources, thrift stores or swapping with friends. 3. Start the conversation with others by sharing the story of your clothing. What is Organic Cotton and why should I care? Texas organic cotton, y'all. Here's why. What in the world is sustainable clothing? Why should I care about a sustainable wardrobe? How do I maintain a sustainable wardrobe? Would you just look at this picture??? This is a great little read about our issue with TOO MUCH STUFF. Here's my favorite quote: "And as the token environmentalist in the room, I’d be remiss if I didn’t remind you that when you buy something, you’re also taking on the task of disposing of it (responsibly or not) when you’re done with it." This 12 minute video contains some interviews with women in the garment industry in Cambodia. The link between prostitution and garment work is incredible. One woman said she would rather go back to prostitution because the pay and conditions are better. We see this theme regularly now... big name brands that have inconsistent corporate ethics. They post on their websites the high standards of ethics, and expectations of suppliers, but then are caught repeatedly with unethical practices. These might include forced labor, child labor, unsafe conditions, disrespect, and such low wages that the women need to work at night on the streets to make ends meet. Buy less and buy fair trade & ethical products. We can live with less and make our dollars count. When the demand changes, the market will respond. Have y'all seen these "hauls" on youtube lately? People go buy tons of clothes (or it's given to them) and then they gab about them in a video. It's mostly cheap, fast fashion. Well I'm saying it's time to Haul OUT! You know why! You know you can be living with less, saving money, making uncomplicated decisions in the morning, doing simpler laundry, enjoying more space in the closet, and most importantly (in my semi-professional opinion), you will find yourself buying new things with more intention. A new garment has to meet your raised standards to be worthy of your purchase and deserving of a place in your wardrobe. Get in your closet and GET RID of the things you no longer wear! Give them to a friend, host a clothing swap, donate locally. And pack away the out-of-season items to save yourself some time and stress in the mornings. My sweet friend Becky let me in her closet recently for a Haul OUT. Becky was nervous about letting go of things and generally what someone else thought of her wardrobe! She was also convinced that she needed more clothes for fall. *For the record, Becky always looks cute. She knows what colors look good on her, and has a simple, easy style for the casual, stay-at-home SuperMom. First, we pulled out everything that DOES NOT FIT, and the things that she rarely wears. Statistic: Women in America have an average of over $500 worth of UNWORN clothing in their closets. Article here. The things that are a little too tight should be donated. However, if you're honestly working on losing a few pounds, go ahead and store ONLY your favorites in a SMALL box. If they don't fit next year, you need to donate the whole box. THE WHOLE BOX. Next, we narrowed down to about 15 tops and 8 pants/shorts to wear this fall. It's hot for a few more months here in San Antonio, so we have a few fall-colored tanks & tees, a few pairs of shorts, a few pairs of pants, a few cardigans/hoodies, and a couple jackets. Her modest collection of scarves will help her keep some variety in her look. She also had a few nice things (a dress or two and a nicer top) that she almost never wears because she felt like they were too dressy for everyday-wear. She agreed to try out wearing them in her normal rotation, especially when she has a lunch date with hubby or a teacher meeting at school. Wear the nice stuff while it's in style! Enjoy your nice things!! All spring/summer tops and shorts were packed away in a tub. If you're hesitant to do this (like I was), you must try it. Your decisions in the morning will be quicker and easier, and it will be exciting to have a "new" set of clothes to get into in the spring. Do it. Finally, everything is hung up. The decisions each morning are easier when all of your options are right there in front of you, and it keeps most of the wrinkles out. Hang up your clothes. Becky had another very cute little helper. These neglected jeans take on a whole new look when rolled up! Re-styling what you already have is the most economical way to update your wardrobe. One more roll on these and they'll look adorable with her winter boots! Take a little time to TRY OUT some re-fashioning with what you ALREADY have! Becky had a pile to donate and a few things to sell. Win! We also found a few things we could alter for a quick, cheap update. I helped her sew on black straps to a casual strapless dress, and we took in a couple inches on the lower leg of some jeans to "skinny" them up. Double win! Becky was thinking she needed a few more things to complete her fall/winter wardrobe, but we discovered that there really was plenty to choose from right there. She gets to save that money now. Triple win! Most of us have MORE than enough, but often feel like there's nothing to wear. (Anyone? I've totally been there.) We have so many choices in the morning that we experience stress and convince ourselves that we need more. Getting organized and narrowing down to just what we need alleviates this stress. Appreciate what you have! Enjoy a little extra space in your closet! And be more thoughtful when it really is time to add. Almost 3 years ago, my friends the Bryants asked if I was ready to go from home-sewing to big girl manufacturing. Not just manufacturing, but to be a part of an amazing mission: to provide jobs for the most oppressed and marginalized of society. 2 years ago, in September 2013, I got serious and visited Nepal and India to make some connections, shop for fabric for my first line of children's clothing, and work on patterns with the beginnings of the Purnaa team! Bhaktapur Durbar Square with Katrina, the weather was amazing in September. Katrina Bryant and I met at Shoreline Church in Destin, FL when we had our first babies. I brought her a meal, and a few weeks later, she brought me one. She spent many of her childhood years in Nepal, and the country still holds a special place in her heart. Her family decided to go back to start Purnaa, an ethical garment manufacturing business, in effort to fight poverty and modern-day slavery, and bring opportunity and hope to survivors. Katrina is a terrific travel buddy. She is ready to engage locals in friendly banter in THEIR language and will not be ripped off. Many cab drivers totally try to over-charge unknowing American tourists. Not Katrina! Katrina smiles sweetly and says, come on, Evan, it's safe enough! American Embassy School on one side, slums on the other in Delhi. Delhi fabric market square... not exactly what I imagined, but still a fabric-lovers paradise! Kuku was proud of his beautiful ikat fabrics. "Look at my beautiful ikat," he said. The fabric for my Saylor Shorts came from Kuku's shop. The shorts are made with printed denim, but the print is on the wrong side of the fabric (on purpose)! He had an extra bundle printed just for me before we left Delhi. Shopping for fabric & notions in Nepal with Preston and Annie of AreRetro. Katrina and Bikash, one of Purnaa's first hires, reviewing applications in the office. At this point, Purnaa only had Bikash in the office and Dadhi helping with patterns and sewing. The team has grown exponentially! Check them out here: Meet the team! Discussing patterns and specifications with Dadhi, master tailor. Corban Bryant, and Preston & Mirjam Thiessen outside the Purnaa building. View from the rooftop of the Purnaa building at dusk. Kathmandu, Nepal. I can't even imagine another way to manufacture. It's imperative that a designer know the people and processes behind their products so she can sell them with a clear conscience. I'm very proud of my work. I look forward to years of working together as we both grow, and can't wait for another visit soon! I can't even tell you how much fun a Ladies Clothing Swap can be. It's a big dress-up party for all your favorite friends, and everyone goes home with some "new," FREE stuff! Everyone was encouraged to bring tops, bottoms, dresses, shoes, bags, jewelry and even intimates. A clothing swap is the most budget-friendly and ECO-friendly way to update your wardrobe. Reduce and reuse! The jewelry counter, with a mirror and Proverbs 31 verses on the wall. You know the drill! Go through your closets and purge! Bring over tops, bottoms, coats, scarves, jewelry, accessories, purses, shoes, and anything else (lingerie, I dare someone?). If it hasn’t been touched in a year, it’s time to offer it to someone else. We’ll try to make it fair. You get to leave with a few nice things if you brought a few nice things. If we have your size. And taste. Uhh, just keep your expectations low and let’s stay friends. There might be margaritas involved. We’ll have a room to try things on, mirrors, and friends full of advice. We played Loaded Questions again to be certain everyone had a chance to be embarrassed. I asked my friends how it was going through their closets and purging the things that don't fit or they just don't wear any more. Everyone had a different experience! It's a personal thing, and sometimes difficult, to let go of your clothes and offer them to other people. Clothing often has sentimental value because of where or whom it came from, or where it's been with you! We also hesitate because many of us hoped to be a different size at this point in life and we're just not! This group is all moms, and our bodies and lifestyles have changed. It's something we have to accept over and over again! It affects our schedules, careers, and even wardrobes. A clothing swap makes a seriously fun party. Give your friends about a 2 week notice to prepare. Send inspiration, like from Jennifer L. Scott and her 10-item wardrobe, or my review of my own capsule wardrobe. We love braids! A cute hair-do is the perfect compliment to your ethically-made outfit! I am so lucky that I get to do 3 very different kinds of hair, and therefore, all kinds of styles. French braids, yarn braids, sisterlocs, and ponytails, all accessorized with hair bows, flowers, and headbands. It's fun. I'm glad they embrace the girly girl inside and enjoy bold and trendy hairstyles with me! So here are some of the fun ways we accessorize our hair! Yarn braids! The quickest and least expensive way to do extensions. She looked like Cabbage Patch Princes Jasmine. So fun. Nya has a sensitive head, so we tried locs with her when she was 4! I started with about 200 micro-braids and every 6 weeks-ish, I would tighten them with a latch-hook. My inspiration was Katelynylyn and Keep Me Curly. It was a little big of work, but it made the day-to-day operation a little easier! The start of her sisterlocs. Feel rewarded by knowing you made eco-friendly and sustainable clothing choices for back to school – while keeping your kid’s looking good too! Before hitting the stores to shop for clothes, why don’t you organize a clothing swap? It’s a great way to minimize the closets and have a party with friends! 1. Invite- Get together a list of friends to invite. While compiling the list keep a tab on what sizes they will likely bring for variety. You could consider co-hosting with friends to increase attendance to the party. When sending your invitation encourage guests to bring good condition clothes, shoes, and even accessories to the swap. Also tell them to pre-sort their clothing at home. Since it’s a party, you could also consider having guests bring snacks and refreshments. 2. Prepare- Prior to the event, pick an area of your home for the swap. Plan what you will use to organize the groups of clothing by size (bins, boxes, tables, etc). Create signage for each group (examples: Sizes girls 5-7, shoes). Decide where you will donate leftover clothes. On the day of the party prepare light refreshments and set up your arena for swapping. 3. Swap- Once guests arrive, have them place their items in the appropriate locations and then get to socializing and snacking! A clothes swap should be fun, it shouldn’t feel like work – like typical school shopping feels. Once you’re ready to let the real fun begin, start the swapping! This can be done at guest’s leisure or if you want you can take turns shopping by limiting the amount of items each person takes per turn. Poker chips or tokens can also be used with a little pre-planning. One token is given per item brought to the party, to be used on one item at the party. Though, with a small intimate group of friends this shouldn’t be necessary. 4. Donate- After the fun is over, make sure you get the remainder clothes to your pre-planned donation station. And Voila! You just exercised an economical and ethical way to shop for new back to school clothes!! Feel free to leave comments below with more tips for making a Back to School Clothing Swap a hit! We did a Clothing Swap! A clothing swap is a FUN, eco-friendly, and budget-friendly way to keep up with your growing children's wardrobes! Get a few friends together and do it! ASAP! Last week, a few neighbors and I brought all of our children's gently-used garments to my living room, spread them out all over the place, and went shopping for our kid's fall wardrobes. I told everyone to keep their expectations down, as it was my first attempt at a swap party! But it was terrific. We're totally doing it again in 6 months, and maybe we'll add a ladies clothing swap and also a book swap. Here are my pictures and advice for YOUR party! One side of the room was girls clothing, the other side boys clothing, and then we had an area for shoes, backpacks, and other accessories. It wasn't as organized as a retail store, but items were mostly in nice stacks of either tops or bottoms. We decided NOT to play a Dirty Santa game for the clothes, but we DID have margaritas and played a few rounds of Loaded Questions. This is one of my all-time FAVORITE games. And this is the Evan-version: everyone writes their answers a few questions on slips of paper, and put them in the corresponding cup. At some point in the evening, you go grab a cup and guess who wrote which answer. Something obvious to consider: make sure you have a variety of sizes! You want to try to have something for everyone, however, the oldest children represented might not receive as much as the younger ones! At the end of the evening, we discussed a charity to donate the remainder of the piles. They'll be receiving a large donation this week! Everyone said the clothing swap was a great idea and we're all looking forward to the next one! I'm trying my first Instagram giveaway! 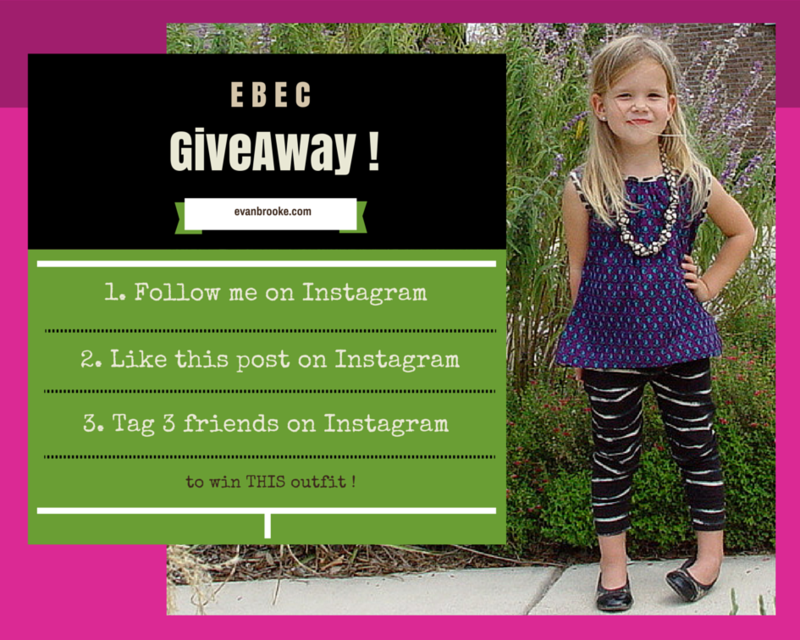 3 things: Follow EBEC, Like the post, and tag 3 friends (ideally friends with girls sizes 2-5). The winner gets the outfit!